Join us live each week at www.productivity.academy/live and get your questions answered by submitting them at anytime right here: www.productivity.academy/questions. You can watch the video for the past episode recorded on June 14th, 2018 above, or you can review the transcript below. How do you keep track of your productivity process? What can you do if you are busy but not productive? What are simple things you’ve done to radically improve your productivity? Hey everybody. Welcome to the live Productivity Academy Q&A number 40. Before we get started diving into some questions, mostly today we’re going to be talking about how to keep track of your productivity process, and then what can you do if you’re busy but not productive. So good questions, and we’ll see if any more come in. We’ve got a couple other things we can discuss. But real quick, I wanna say if you’re watching this outside of the Real World Productivity Growth Group, you can join wherever you’re watching this. You can just find the link below. 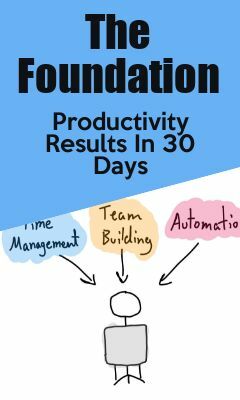 Click the button if you want to be around other people who are interested in productivity, organization processes and growing both themselves and their business. And it’s a good place to be. It’s a free group, just answer the questions. I want to know that you’re serious. Three just basic questions, and we’ll let you in the group. And also if you’re watching this delayed on YouTube, first of all, thanks for watching. Secondly, you can click on the subscribe button and stay up-to-date. You’ll just get notifications when new Q&A’s are out, and I do occasionally upload new content just for YouTube. So be sure to hit the button if you’re interested in that, and other than that, let’s get into it today. So hoping I can make use of these two. So I’m not gonna force the white boards, but I really like having these behind me. So if it ever comes up, I’m happy to draw some stuff out. Let’s go with the first question here. And it is, how do you keep track of your productivity process? So I think it depends exactly what you’re asking, but I think the way I’m gonna go with this is, how do you keep track and improve your process? How do you know it’s actually working for you? And the way I do this, it sounds really simple, but I schedule time to actually think about what’s working well for me and what isn’t. If you’re talking strictly about how productive am I, you could do better time management and maybe time blocks and see how long it’s taking you to do certain tasks or projects. And look at how you can become more efficient, but I’m not gonna approach it that way. But I’m just going yo interpret this, hopefully I get it right, that you’re looking at, how can I actually look at my processes and see how I can improve or not. And I think that this is something that a lot of people gloss over, or we feel like we don’t have the time to do. Like a lot of life nowadays, we’re busy or we’re distracted. There’s a lot going on, and sometimes you just need to stop, slow down, and I think you could do this no matter where you’re at. If you’re in your own business, if you’re working out of a home office like I do, if you’re at a job and maybe you need to schedule this outside of job hours. But it will pay off. Just sit down 15, 30 minutes, and once a week is how I do it. You know, again, set whatever works for you, and what is the one thing that’s worked the best for you, right? And so that’s highly subjective. Is it made you the most money? Is it saved you the most time? Is it some other result? And that’s up to you. You just define that, and so write down a few. Write down some ideas, or based on what’s actually happened, write down hey, what is it that’s working really well for me that’s getting me the results I want. And the followup to that is, how can I get more results like that. Okay, and just to give you some ideas, can I take what’s working for me in that area, that’s working really well, and apply it over here in this other area. Obviously sometimes you’re gonna have to have some changes or things, but just hey, if it’s working, don’t beat yourself up. Maybe I can use part of that or the whole process somewhere else. I think it’s also really important to look at the other side of this. What’s not working for me? Did I try a new tool, and it’s taking me way longer than I thought to learn this. It’s just not providing results. Okay, can I fix it quickly? Or can I just ditch it? You know, things like that. And the improving and looking at how you can do both. Either get that better results from significant wins, and how to decrease the losers or the things that are holding you back. So again, this could be as little as 15, 30 minutes a week or less. Maybe do a monthly review. But I find that a lot of people, we tend to focus not on how we can improve, but maybe on the specific project. I think just taking that step back and taking that time and just thinking about it and literally writing that down will help you out. So I’ve found it to be incredibly helpful for myself, and now that I’ve seen the whiteboard, I just think I wish I had something cool to draw. But you know, it’s literally … I think I’m using … I don’t think. I’m using Evernote, and I just do one each week. And sometimes just a couple sentences and just reflecting back. And I consider that investment of myself instead of just continually doing the same thing. Just taking that time to reflect, saying yep. Okay, yep. This is the whatever it is. Using, getting a virtual assistant to do x, y and z. Or trying a new tool like Airtable to create an expectation value calculated that I talked about last week. Maybe that provided some really big results, but starting out identifying the themes, you know? What generally works for you and what doesn’t. So good question. Alright. Next question today. Excuse me. What can you do if you are busy but not productive? So that’s a good question, and I think again, it depends on your level of control of the situation. Obviously, I talk more with entrepreneurs or people who are either maybe in a higher level positions in a company or own their own business, but this applies again to anybody no matter where you’re at. You need to take charge of your own time and as much of it as you can and start to analyze your own situation. You could do this doing once a week like look back on what you’re doing, or as always, I recommend doing a daily review. And just saying, “Okay, here’s what I have to do, and here’s how it’s gonna fit into my tasks. And here’s my long term goals. How does all of this fit together?” How you go about doing that is personal. I’ve got some great recommendations for doing a daily review on the website, productivity.academy, but looking at that and seeing how all of this stuff fits together. And you’ll start to see, okay this is just work. And work has to be done by somebody, but can you delegate it? Can you delete it? Can you throw it away? Can you automate it? And just seeing what you can do with that, and sometimes it’s the little stuff that counts, right? Just the little forward progress everyday is gonna amount to a lot over time. Sometimes it feels like you’re not moving, but if you just make that effort once a day or once a week to automate or get something off your plate or become faster or better at it. You’re gonna really start seeing those improvements start adding up, and it’s cool to see. It’s cool to experience, and you just gotta remember you’re investing in yourself ’cause it does take effort. And it does take a little bit of time. But I think that that’s a great way to do it, and then scheduling that time to look back and do nothing but say hey, what am I working on? Is it working well for me? What’s working the best? What is not? And how can I get more out of the good things and do less of the bad things? And just doing that process, it’s gonna be something that most people don’t do. And I guarantee it, if you do that, and you invest a little bit of time once a week, once a month into doing that, you can see some pretty dramatic results. Okay, let’s see. Third question. What are simple things you’ve done to radically improve your productivity. Oh man. So many good answers to this. I wish I had had one before hand because there’s my go to. I recommend it to anyone, and I’ll start with this. And I’ll probably add one more onto this but doing that daily review. Getting into the habit of sitting down every single morning, and it could be two minutes. You’re traveling. I literally use a post-it sometimes because it’s better than not doing this. Just sit down and being cognizant of what is going on in your day. Check your calendar. Have a process for it. You could write it down, use an app, or whatever you need to do, but what are the main things you do. And I have my work day one, where I look at the calendar, I look at to-do lists, I look over any projects I’m involved in. I look at my long term goals, and I plan out my day. Maybe I’m traveling. I just get a post-it. I look through my calendar. Make sure I’m not gonna miss any important meetings or phone calls or stuff I had scheduled and forgot about and just real quick. Oh you know, even on vacation, hey there’s something I want to do today. Here’s what I’m gonna do, and here’s … I’m gonna spend the rest of the day reading and running around and doing this or that. And it also helps me get that feeling of accomplishment and just feeling … You know, instead of just being kind of restless which I personally like, and I think a lot of people do too. I enjoy free time. I don’t need to have it all planned out, but I’ve found that that really helps me. So yeah. Daily review is the big one, and then radically improving my productivity is looking back. There’s really a theme to these questions today. This is good. Looking back and investing a little bit of time in myself every week, and it was tough to get this habit started, but looking and saying what’s worked well for me in terms of my productivity processes or just processes. What’s working? And being honest with myself and saying where’s the big wins coming from? And how can I get more out of that? Can I copy that process and put it over here and get better results on this? And then being honest with myself. What’s not working? And just saying okay, I either need to fix it if it’s broken. If it also … Is there a reason it’s broken? Is it me? Is it someone else? And then can I automate? Can I get rid of it? And these are pretty common themes you’ll hear a lot about from productivity books, guides. You’ve got a few things you can do. You can do it yourself if it’s really important. You can automate it. You can delete it. You can delegate it. There’s a couple of other ways of thinking about it, but I think that that’s helpful. But to circle back, definitely investing that time and just reflecting. Taking a step back and taking a higher level view, and saying what’s really been working well for me? Okay. And what has it? And again, I think that’s something a lot of us tend to not to do. We get really overwhelmed, and we’re busy. The creating process. Trying to automate. Trying to do this and do that. And if you can invest in yourself 15, 30 minutes a week and just sit down and think about that. What’s really produced those results for me? And what can I … Can I double down on that? And then again, what’s not working? How can I cut it out or do something else? And I think that’ll really, literally, could radically improve your productivity over time. So good question. I’m going to check the page real quick. I think that’s about it for today. And let me check the page. If you’ve got any more questions, I’ll keep this up for a minute. Let’s see. Alright. I think that’ll do it. So thanks for checking it out, and if you haven’t yet and you’re on YouTube, hit the subscribe button. If you want to join the Real World Productivity Growth Group on Facebook, please join us, and you can find the link in the description below. If you’re in the group, thanks for watching, and if you ever have questions, you guys know where to ask them. So thanks for watching, and I’ll see ya next week.